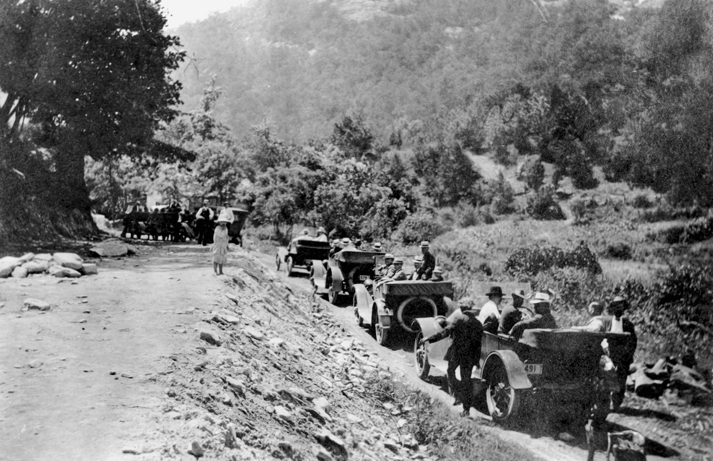 The Good Roads Campaign to improve North Carolina's roads and highways was first launched in Asheville in 1899 by the Buncombe County Good Roads Association, ultimately leading to the state earning the nickname the "Good Roads State." In February 1902, after the U.S. Department of Agriculture's Bureau of Public Road Improvement had sponsored a "Good Roads Train" to provide demonstrations of road-building techniques to a number of communities, the North Carolina Good Roads Association (NCGRA) was founded in Raleigh. It was organized by Good Roads Association leaders on the local and county level, and by state geologist Joseph A. Holmes, who invited National Good Roads Association president W. H. Moore to preside over the initial meeting. The purpose of NCGRA was to promote the building and maintenance of the state's roads, which lagged far behind much of the nation's. P. H. Hanes of Winston-Salem was its first president, serving from 1902 to 1910. As interest in good roads grew during the next decade, several thousand North Carolinians joined local Good Roads Associations, urging their county governments and the state to finance highway improvements. In 1912 Locke Craig was elected as the state's first "Good Roads Governor," and in 1917 a State Highway Commission was established. Leading figures in the Good Roads movement included University of North Carolina geologist Col. Joseph Hyde Pratt; Lexington publisher Henry B. Varner, who served as NCGRA's second president (1910-18); and Harriet "Hattie" Morehead Berry, who was designated the "Mother of Good Roads" for her successful lobbying on the issue (in 1986 the State Department of Transportation named Orange County's 12-mile segment of Interstate Highway 40 the Harriet Morehead Berry Freeway). Under the leadership of these individuals, and with the public interest generated by the automobile, the Good Roads campaign prospered. Between 1910 and 1920 Varner published Southern Good Roads, a periodical that served as NCGRA's unofficial organ. Presenting testimonials in support of road building, methods for sound road construction, and a variety of advertisements for road machinery, the magazine enjoyed considerable success as the Good Roads movement gained momentum. By 1915 NCGRA was instrumental in creating the state's first Highway Commission, and by 1921 it had spearheaded a successful lobbying campaign for the General Assembly's passage of a $50 million road-building bond issue. These actions resulted in the modern state highway system. Cecil K. Brown, The State Highway System of North Carolina: Its Evolution and Present Status (1931). 1 January 2006 | Ireland, Robert E.; Williams, Wiley J.